have declared this blog a meme-free zone. While in Porto on vacation this month, we took a class on baking Pasteis de Nata, a custard tart we fell in love with in Lisbon a few years ago. This recipe is originally from our course instructor as part of the class, with our own notes and adaptations added. Makes a double batch of puff pastry, about 20-24 cupcake-sized pasteis shells in total. In the class we actually used margarine. Our instructor, Joana, explained that it works better than butter under less-than-optimal conditions, like at normal room temperature, or when you’re not rolling the dough out on a marble countertop. I’m thinking about making this dough outside on the patio next time. Joana didn’t specify the amount of salt. Our first batch at home was with a half-teaspoon, and it didn’t seem like enough. Combine flour, water, and salt in a stand mixer with a kneading attachment and knead for 4-5 minutes. Alternatively, combine and then knead by hand for 10 minutes. You want a soft, not-very-sticky dough, that springs back at you when you poke it. Let it rest for at least 5 minutes after kneading. Roll out the dough on a large floured surface in as cool a place as possible. We opened our doors and windows (in November!) to drop the room temperature down to about 15,5 °C and that seemed to help. You want a rectangular shape, about 45 cm in the long dimension, with the dough a half-centimeter thick. Put the block of chilled butter (perhaps cut it into two skinny squares) in the middle of your rolled-out dough and fold the edges of the dough over it, like you’re wrapping up a present (and you are — the butter is the present to yourself). Beat the heck out of that butter-wrapped-in-dough package with your rolling pin. You want to flatten the butter inside its doughy sleeping bag. Try to maintain the rectangle shape; rotate the dough 90° every few whomps with the rolling pin. Sprinkle flour to cover up any spots where the butter might be leaching through. If the butter has warmed up during this process, stop and refrigerate your dough and don’t proceed until the butter is cold again. Fold it again, this time in thirds, like you’re mailing a letter of confession to your cardiologist. Let it rest for at least 10 minutes. Roll it out again to the rectangular shape. Do this at least two more times. On the last roll-out, sprinkle a little water onto the surface of the dough and then smooth it around with your hands. Starting on the long side of your rectangle, roll up the dough like it’s a treasure map (it is) you’re going to stuff into a bottle and set adrift on the open sea. Stop rolling when you get about half way and cut the roll away from the remaining flat dough. 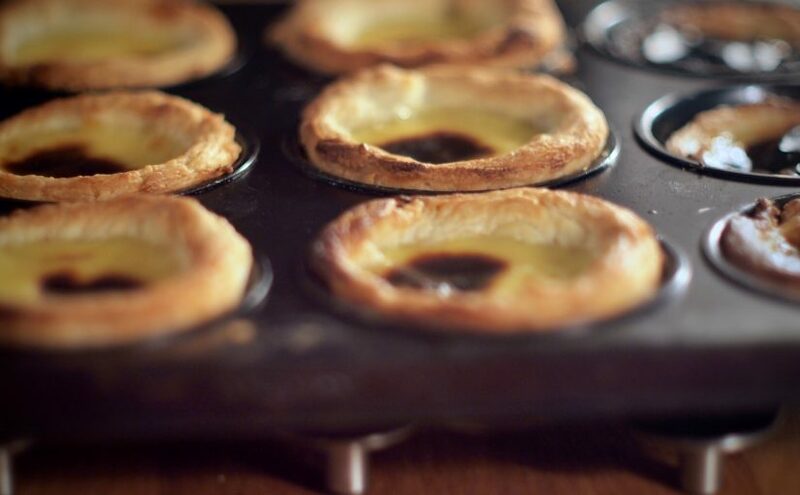 Put that roll aside in your freezer for another batch of natas. Roll up the remaining half of the dough in the same way. Cut the dough roll into about 1-inch segments. Each segment will become one pastel. Take a segment of the roll, rotate it onto its side (so the the layers inside the roll are visible to you), and with wet thumbs and fingers, squish the segment into the cupcake pan, drawing the dough up the sides of the cupcake mold from the center of the segment with your thumbs. It’s OK to have thinner pastry coverage at the bottom; you want it to be thicker around the edge at the top. In a small saucepan, combine sugar, water, lemon zest and cinnamon stick. Let it come to boil in at medium heat. You don’t have to stir (much). Just let it come to a healthy boil. When it starts boiling, count 1 minute and remove from heat. Set it aside. In another pan, first combine flour and corn starch and then add the milk. Whisk it before putting it onto the stove. Cook the milk, flour and starch on low heat, always whisking. When the texture thickens, take it off the stove. Remove the lemon peel and cinnamon stick from the infused syrup you made and discard them. Gently, add the syrup to the milk, whisking it until it’s fully combined. Let it rest a little while before adding the egg yolks, tempering first. Whisk everything together, pass it through a strainer (if you didn’t temper the eggs effectively and have scrambled bits) and pour it into the dough cups, about 3/4 of the way full. You want it as hot as your (home) oven can go. We get ours up to over 250 °C. Make sure it has plenty of time to preheat — at least 30 minutes. We turned the convection fan on for the bake. Ours were done after about 12 minutes of bake time. Don’t touch them while they’re baking, and try to let them cool a little before you put them in your mouth. They should pop out of your cupcake pan quite easily (thank you butter!) once they’ve cooled a bit. You can sprinkle them with sugar, cinnamon, both, or nothing.